Tribune Chronicle / John Vargo YSU's Darius Quisenberry, center, drives as Detroit's Marquis Moore, right, and Willy Isiani, left, defend. Shot swish, others clank off the rims inside Calihan Hall for a few collegiate players. It was a Friday night a couple of miles outside one of our nation’s largest cities. The Motor City has tried to reinvent itself, modernizing the downtown area, making that area more palatable to visitors. The drive to Calihan Hall was depressing and has plenty of abandoned buildings, check cashing businesses and liquor stores. Depressing to say the least. Hope? There’s not much here to the outsiders, but for some of those who live there, they have that resolve to make their communities the best they can. Resiliency makes things better, but it is a process. The Youngstown State men’s basketball team kept shooting around on that Friday night, getting a feel of its surroundings prior to Saturday’s 72-70 win over Detroit. It broke a 12-game losing streak to the Titans with its first win inside Calihan Hall since 2011, a place which had the feel of Ohio State’s St. John Arena with its steep steps. One false step down the concrete and you’ll likely find yourself in a local hospital. Yes, I was afraid of doing just that as I came down from sitting in the Bob Uecker seats before Saturday’s game. Just for a different view. There was no fear in this YSU team on Saturday, only confidence. The Penguins (8-16, 4-7 Horizon League) were down by six with about 4 minutes remaining against a Titans team who has found a way to dominate this YSU teams in years past, 2014 was the last time the Penguins could call themselves winners against these Titans. Putting two straight wins together hasn’t happened since early in the season against Heidelberg and Columbia. This is Oakland and Detroit, two of the better teams in the Horizon League. There’s one dominant team in Northern Kentucky and a bunch of teams vying for spots in the top eight in the Horizon League tournament. The nine and 10 seeds don’t participate. YSU is a half-game out of eighth and hosts Milwaukee Thursday, the start of a four-game homestand for the Penguins. Five of the next seven are at the Beeghly Center to end the regular season. The Penguins are 0-4 at the Beeghly Center, but 4-3 away from Youngstown. This is a team which needs to find a way to harness the good vibes they had in southeastern Michigan and bring it back to Youngstown. 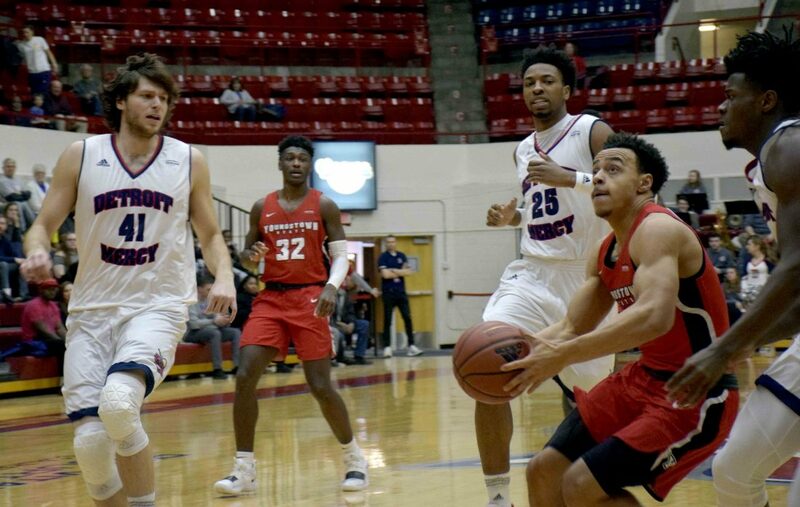 Freshman point guard Darius Quisenberry had already made a late 3 to pull YSU within two of Detroit. Naz Bohannon came out of the locker room at halftime exuding confidence, telling his team they were going to win — something he wants his Penguins to do in mass quantity to end the season. You could hear his voice echo down the hallway, down stairs and into the playing surface Saturday. It’s a young team, filled with mostly freshmen, sophomores and first-year junior college players. They’ve finished out the last couple minutes of a game these last two, something that hasn’t happened much this season. The Penguins are getting to plenty of 50-50 balls, sacrificing their bodies as much as a Premier League goalkeeper facing a barrage of shots on goal. YSU’s only two wins at home are against NCAA Division III teams Westminster and Heidelberg. The last Horizon League home win was Feb. 14, 2018, a buzzer-beating win by the Penguins over Oakland. Since then, the Penguins have lost six straight league games at home. YSU snapped a 12-game losing streak against Detroit. YSU snaps that home Horizon League losing streak if the Penguins team that won these last two plays the same Thursday against Milwaukee and beyond. “Coach told us the biggest thing with young guys is to handle success,” Bohannon said. “Go back to the drawing board and prepare the same way if we were down 0-2 as we’re the same way we’re 2-0.